Official Blog Of Jennifer Jones, Royal LePage Metro, Sackville, NB : NEW LISTING!! 3+2 Bedroom Home For Sale in Westcock!! NEW LISTING!! 3+2 Bedroom Home For Sale in Westcock!! Westcock, Sackville - Private setting! 3 bedroom open concept back split home with potential for more bedrooms in the basement. Sits on a beautiful 2.39 acre lot with many blackberry and blueberry bushes. Perfect property for the organic gardener. 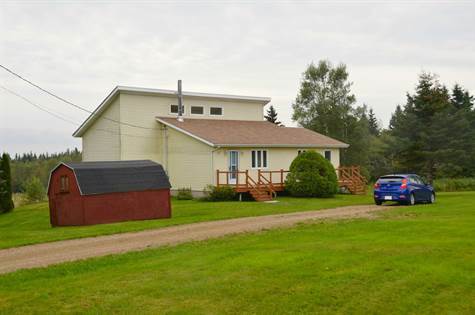 Home features a large living room with vaulted ceiling and woodstove, eat in kitchen and large new side foyer/ mudroom. 3 good sized bedrooms and full bathroom. Downstairs has tons of space, two rooms could be bedrooms or family rooms, lots of storage space too. Attractive deck on the front of home. Playhouse or storage shed and detached garage. Possible hobby farm. So close to downtown Sackville and with low low taxes! 15 minutes to Amherst and only 30 minutes to Moncton. Call listing agent for more details and showings.